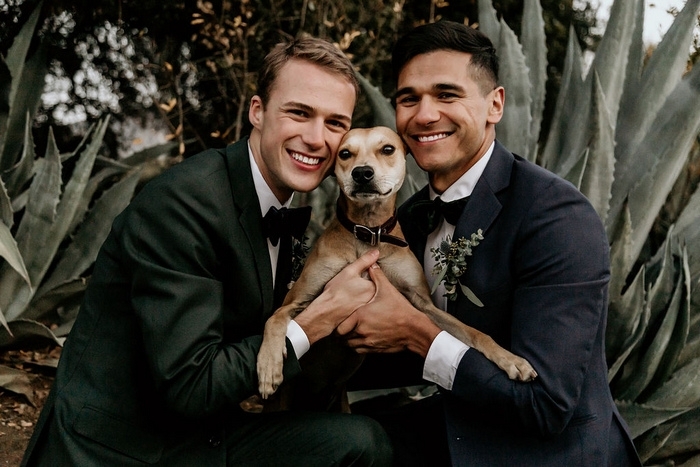 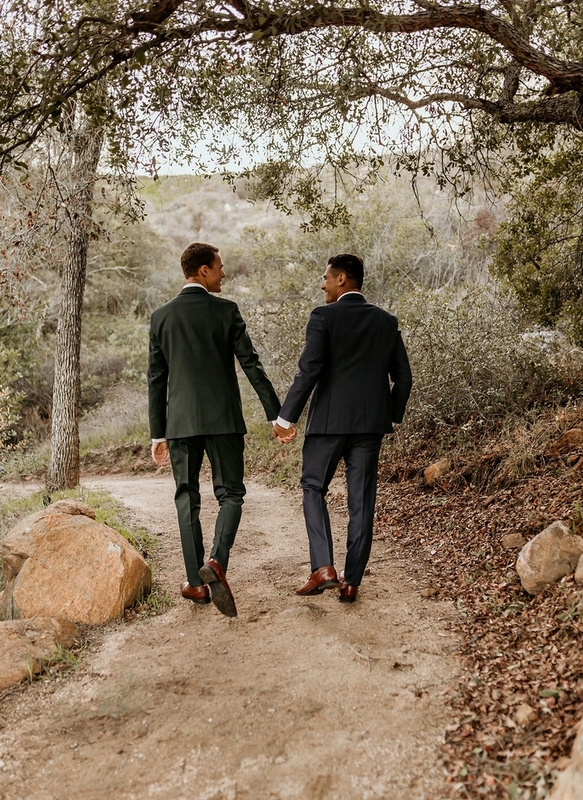 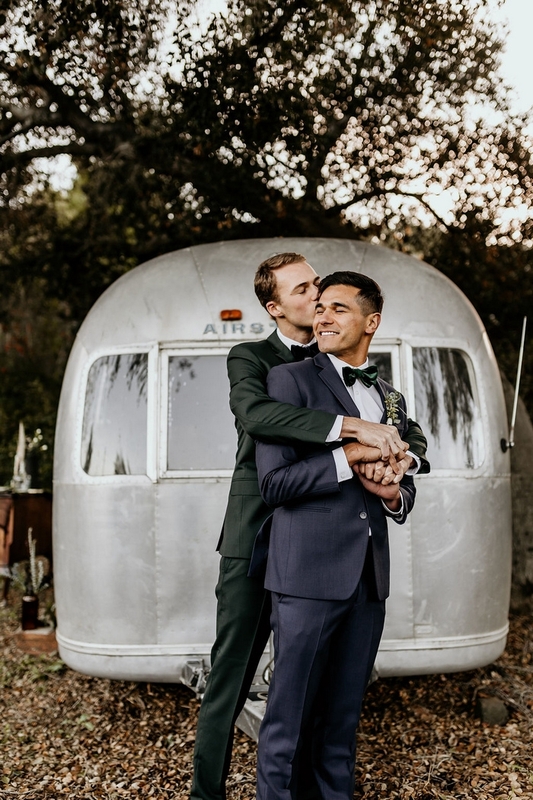 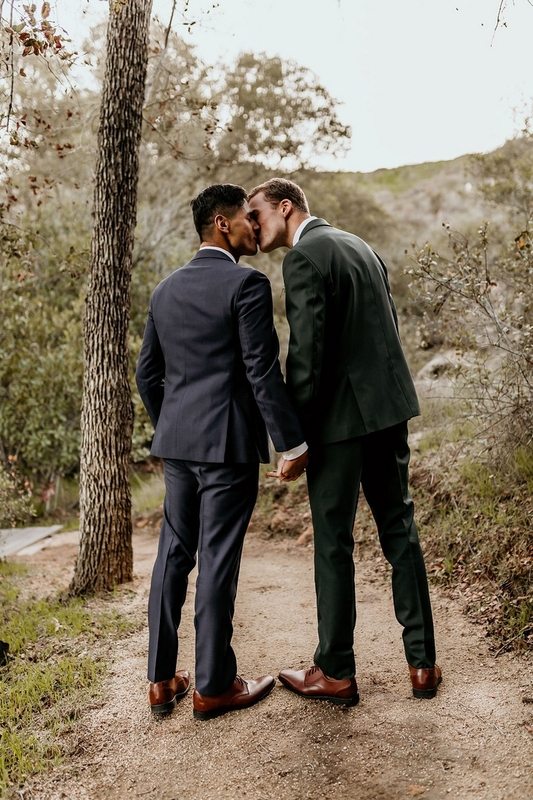 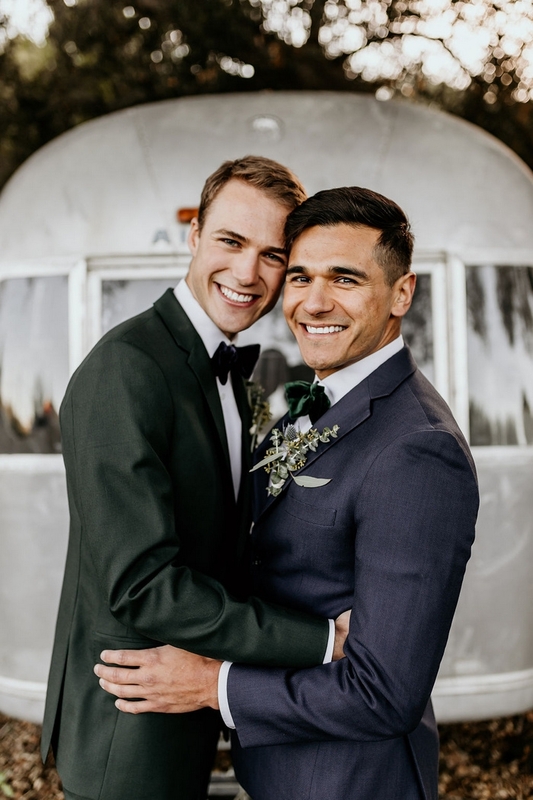 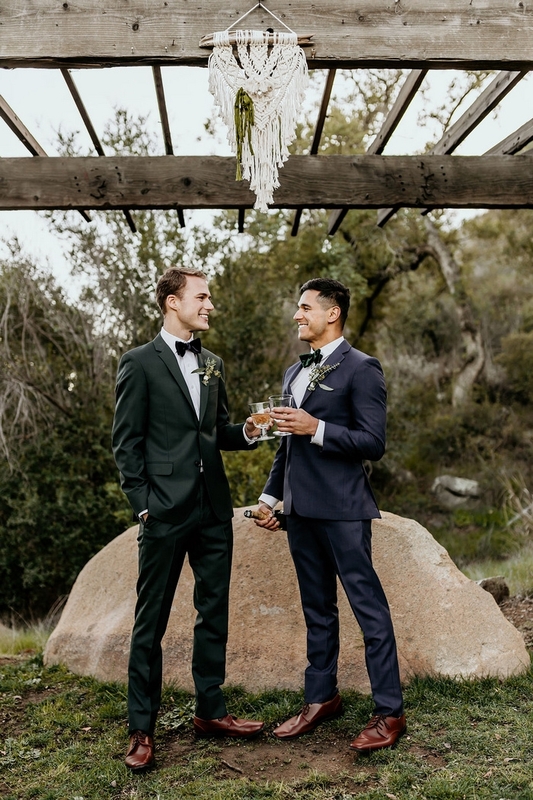 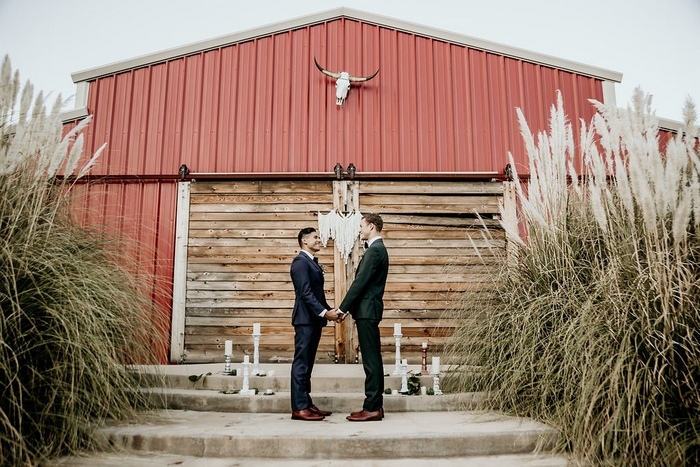 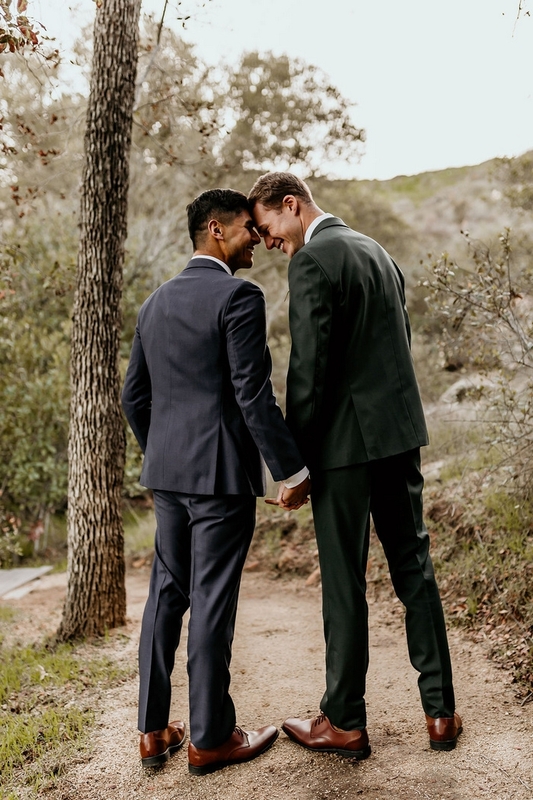 Two handsome grooms in gem-toned tuxedos and velvet bowties; a mystical California ranch – complete with a 1968 Airstream; a decadent geode cake and an adorable dog. 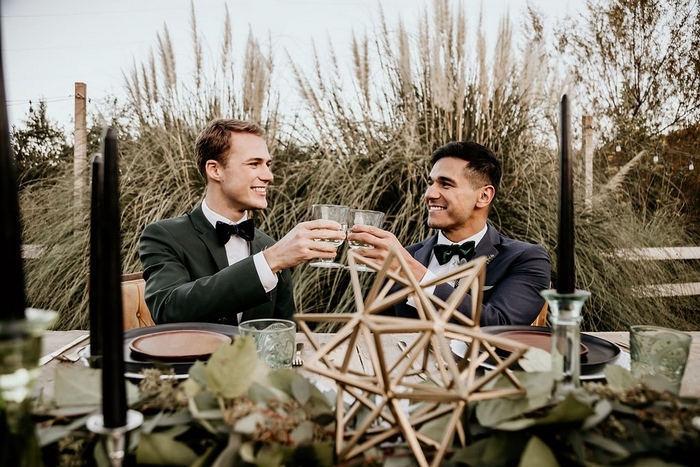 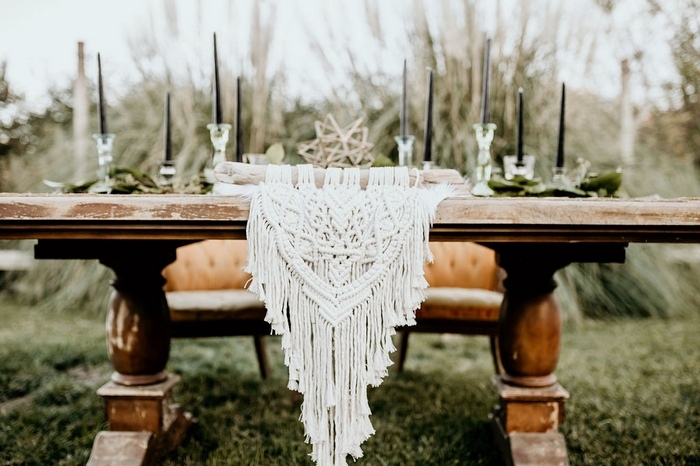 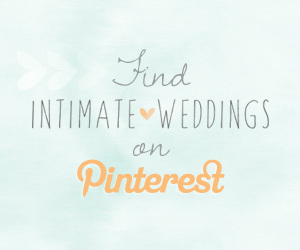 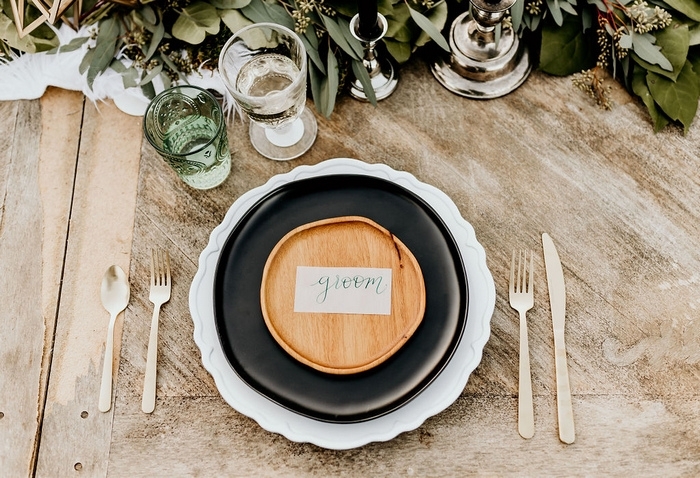 Is there anything not to love about this styled shoot? 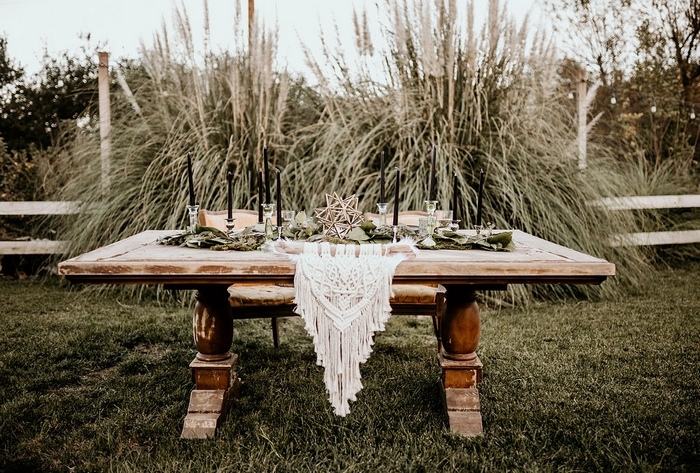 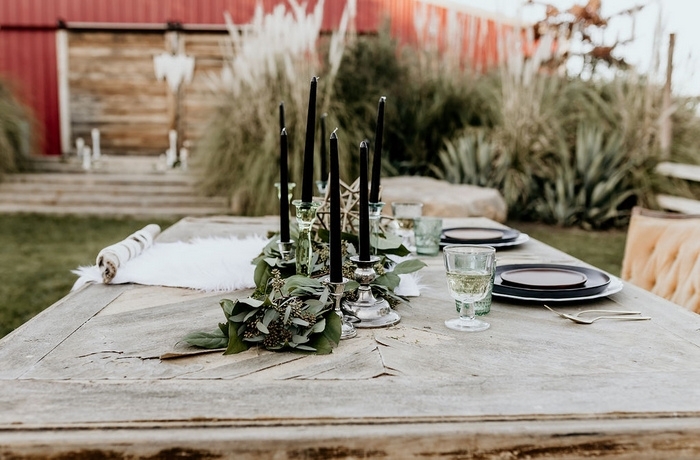 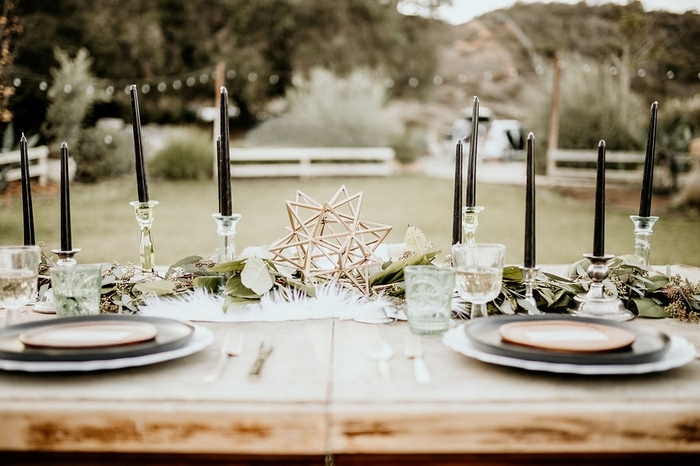 Nestled within Temecula Valley, Retro Ranch created the perfect backdrop for this earthy winter elopement. 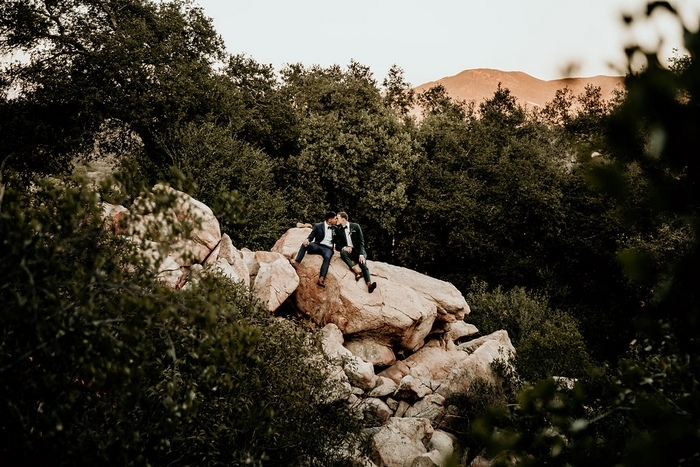 The private 10 acre estate provides endless areas throughout the property and hidden locations to capture those unforgettable memories. 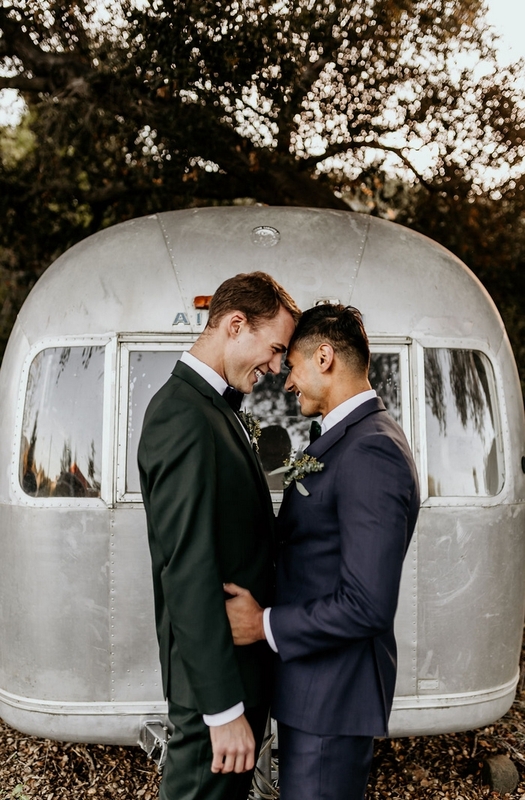 The retro 1968 Airstream also provided a fun backdrop for the cake and dessert area. 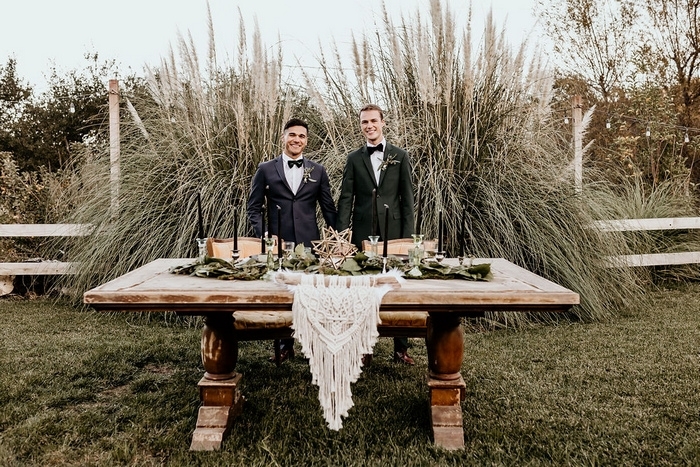 Hues of emerald green, sage, taupe, ivory and slate created a modern twist and was visually breathtaking. 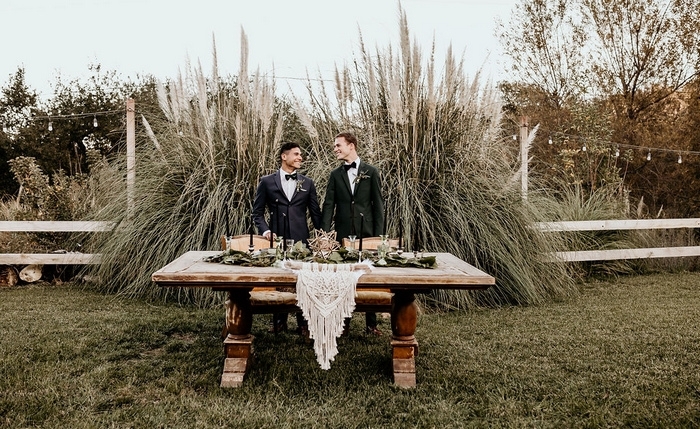 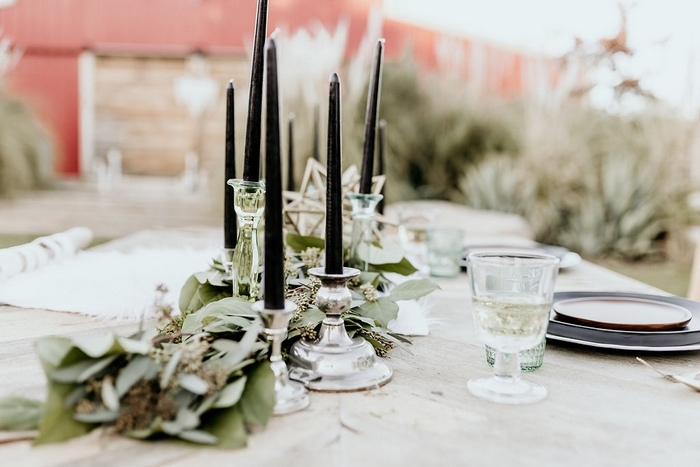 The inspiration added a little mystery and masculinity to this earthy winter elopement. 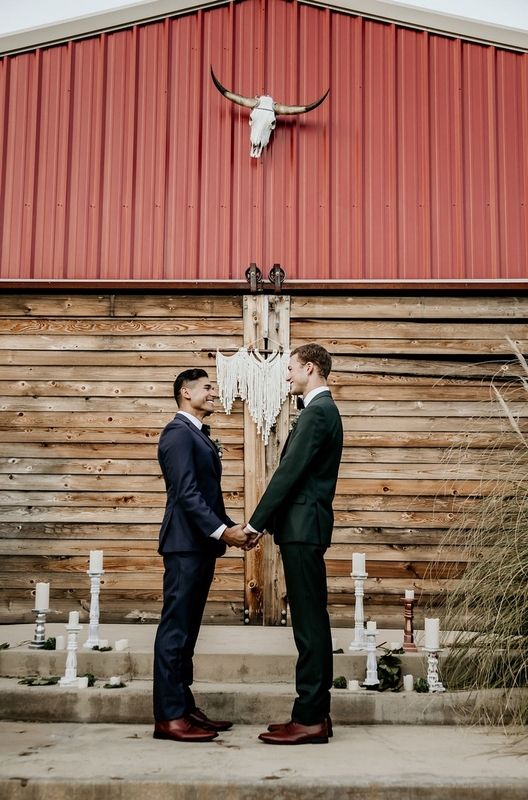 For the ceremony, an assortment of candles lined the stairs of the red barn as they exchanged “I dos” to give a romantic edge while the subtle but detailed textures of the amazing macrame art made by Ox and Nag was the perfect ceremony piece along with some pieces throughout the reception and dessert station. 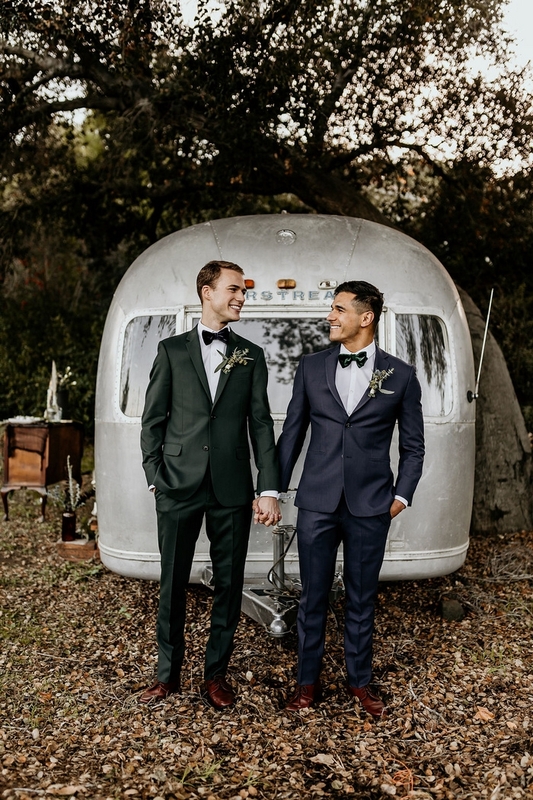 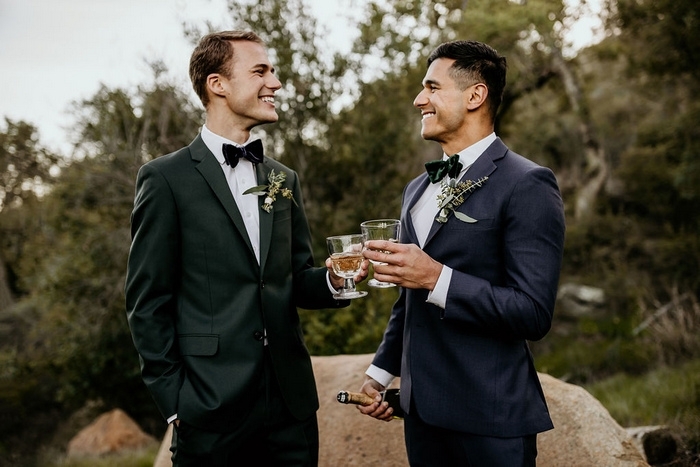 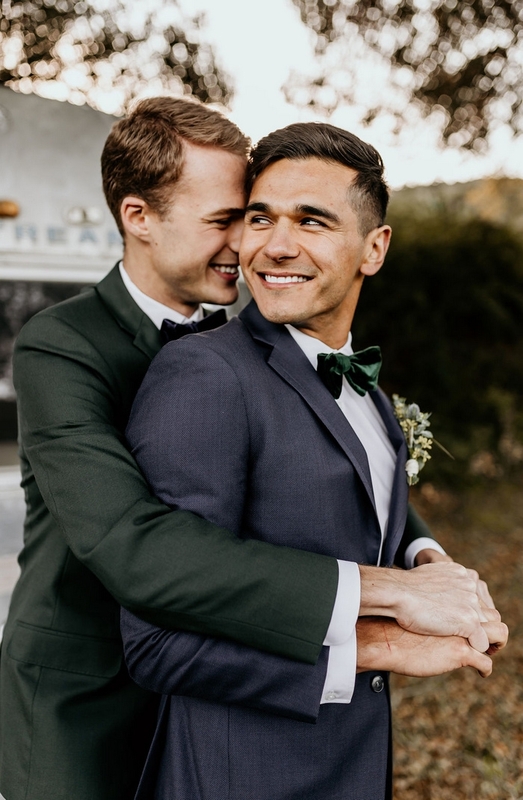 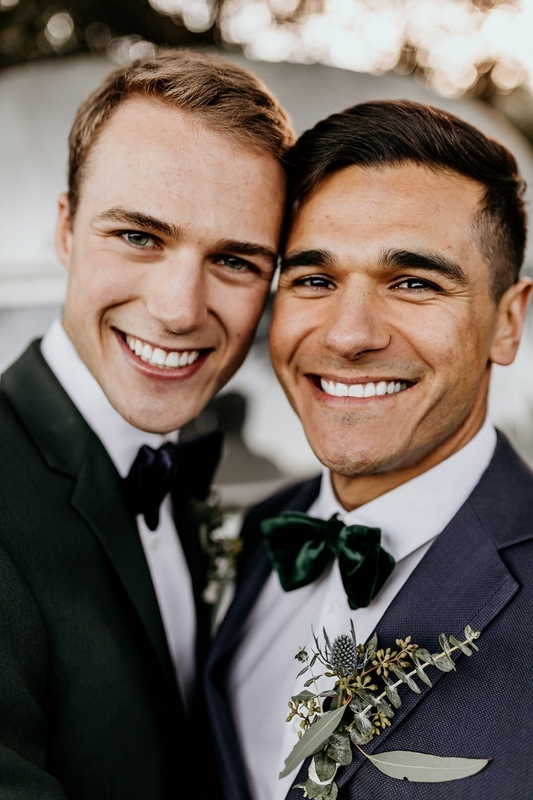 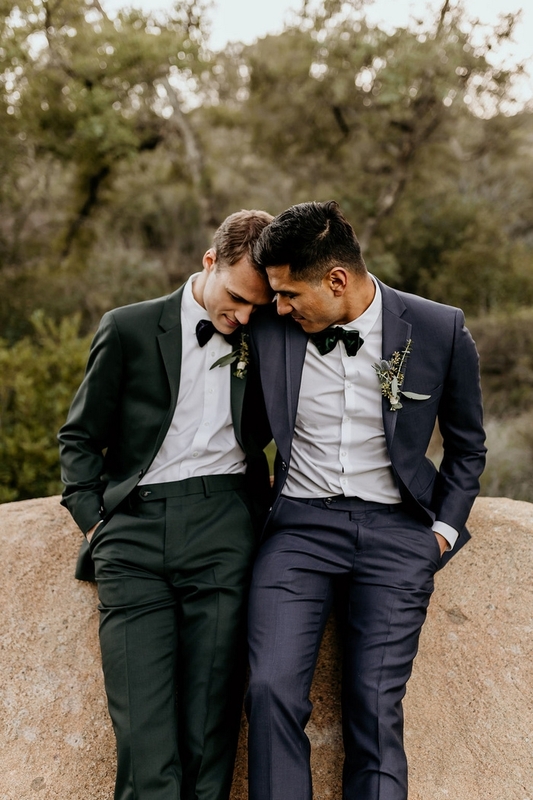 Perfectly coordinated for the occasion, each Groom looked sharp as they wore emerald green and navy blue tuxedos paired with velvet bow ties to add some texture from Stitch and Tie, and beautifully accented boutonnieres provided by @bloomiecreations . 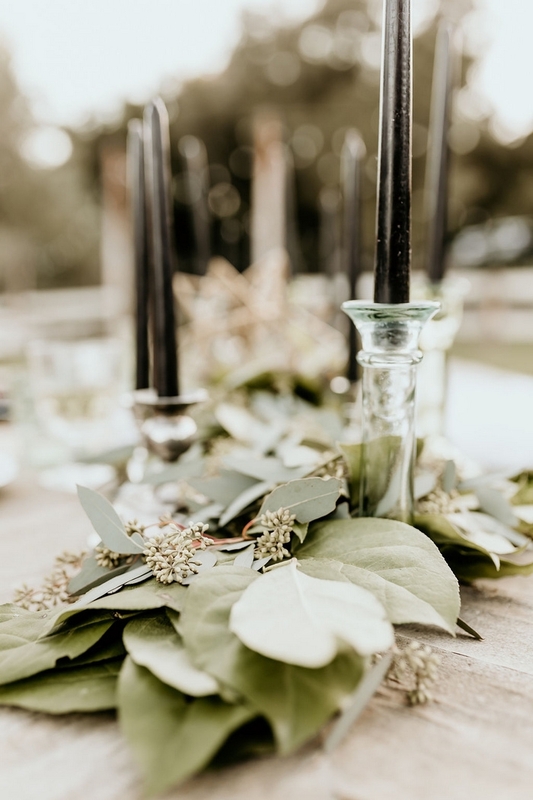 Along with a beautiful head table presentation that included eucalyptus leaves, faux fur, moss and slate colored candle sticks to tie everything together. 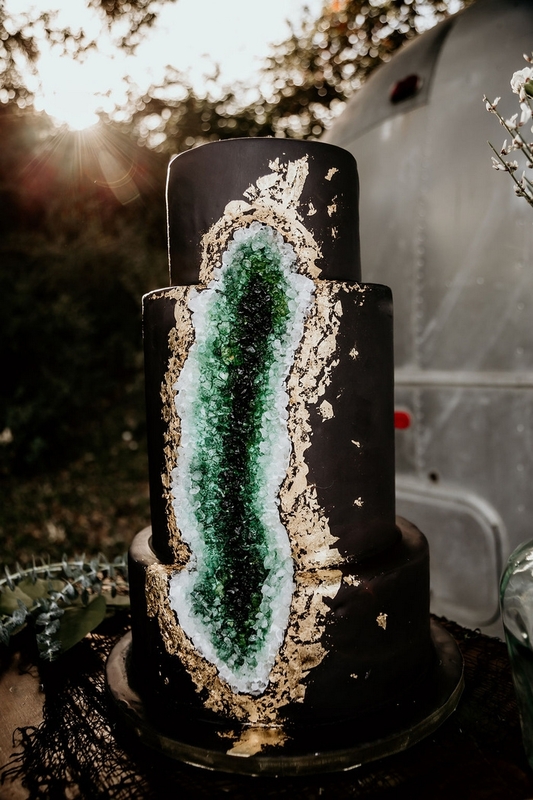 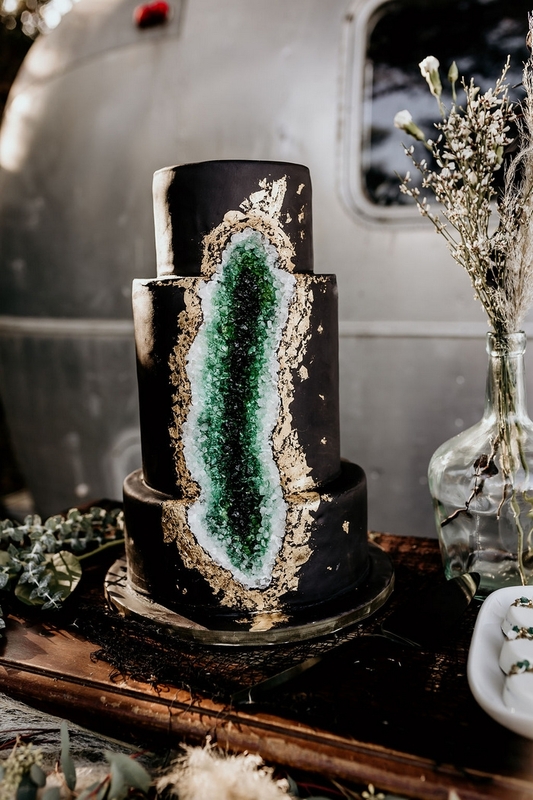 The Sweet Apron designed a visually stunning geode cake that incorporated the color palette perfectly. 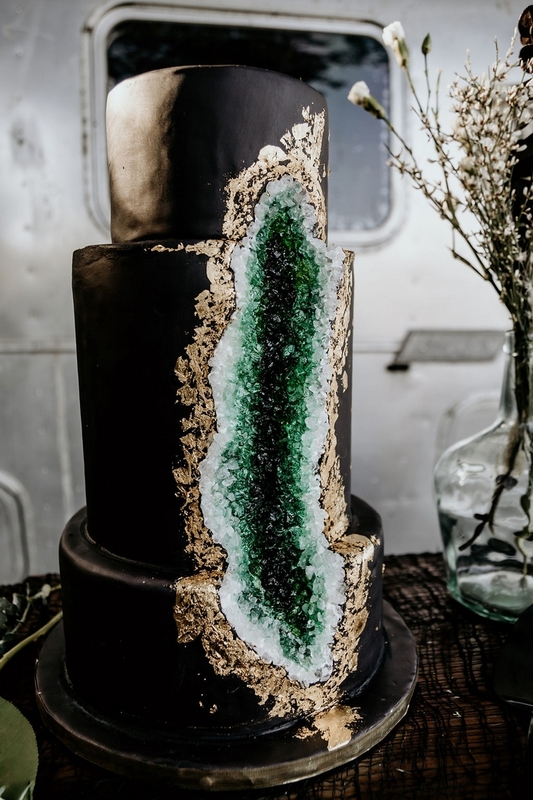 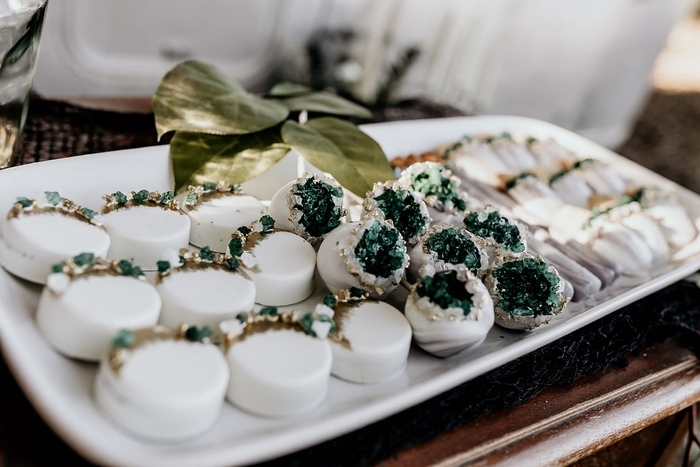 The geode design continued with the delicious pastry spread of white chocolate covered Oreos, Madeline’s, cake pops, and marbled designed chocolate covered pretzels all provided by @vlocakepops . 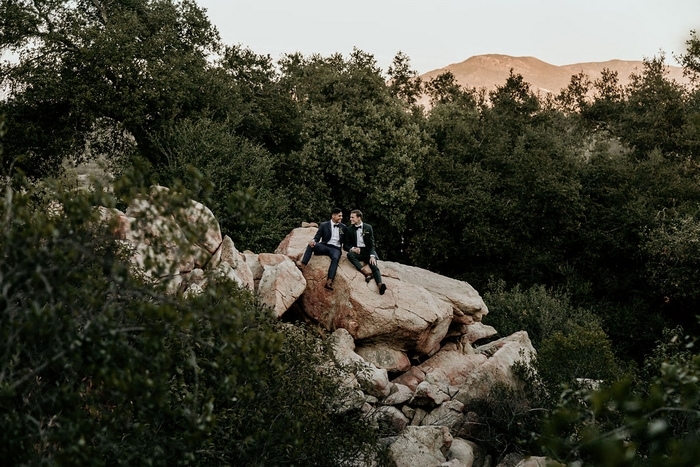 A hike to the wondrous and picturesque views along with a champagne toast to celebrate the occasion and their dog “fox” made for a perfect way to start the first day of the rest of their lives together.